I recently set a new personal best for Ancient Lake. (I have some Goldeneye times on YouTube too by the way). Last edited by Vyothric on Thu Dec 30, 2010 1:24 am, edited 1 time in total. I could be wrong as it's been ten years since I played it, but I'm sure there's another speed boost off track just after the first one (near the stone pillar). Me and my mates used to play this game to death, I'm sure using that other boost was the fastest way round the track . On the non-time trial race there's a Blue Balloon on the grass. No zipper though. I have to check where i was at but i think 44 secs or so. I will have to pick it up again. The World Record with Car is a mid 42 secs time, very hard to get consistent. The records with the Plane are ridiculously fast down at 32 seconds due to the extra boost plates in the air. Did you play Mario Kart 64 also for any Time Trials? I used to compete on that back until 2002 around when i played DKR but later worked my way back to the original on SNES. It was always Diddy Kong Racing instead of Mario Kart for me. I did play Mario Kart back in the day, but only from borrowing it from a friend as I only got my own copy recently. Vyothric wrote: It was always Diddy Kong Racing instead of Mario Kart for me. I did play Mario Kart back in the day, but only from borrowing it from a friend as I only got my own copy recently. DKR was a fun game, just some of the responsiveness was a bit annoying with plane wings getting caught on walls at the tip and the strange handling of the hovercraft. Stacy Needham who is UK overall TT champion on DKR did figure out from the Japanese players how to handle the Hovercraft better and get higher speeds on it by snaking in a way. It is odd but works somehow. He has also competed on some of the Mario Karts reaching around the top 8 or 9 in the UK on Super Mario Kart SNES and recently UK #1 at Mario Kart Super Circuit for the GBA. Most of the records for DKR are all on cyberscore now, but we have our own built ones for the Mario Kart series.. The site was being moved/updated - should be alright now. I just compete with myself these days really. (haha! take that me from X years ago!). It's perhaps not quite as rewarding. Though it is always infuriating to watch your own ghost zoom away from you on DKR. Vyothric wrote: The site was being moved/updated - should be alright now. The good thing is we have the official sites which we have worked on since the later 90s and thats the best place to go. Im not into speed runs in A-Z games really either, most others are just for fun. I only got into keeping records on Super Mario Kart snes which is my main game. 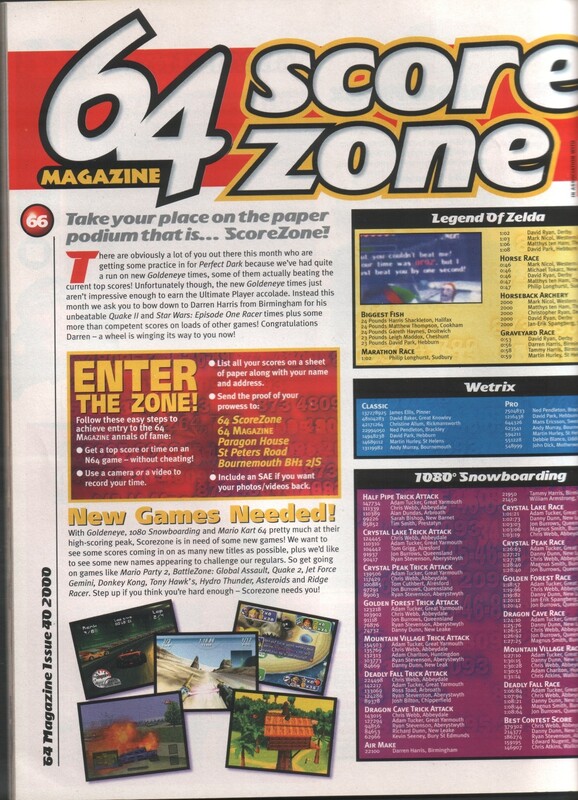 This branched out into the other Mario Kart games, Diddy Kong Racing and a bit of F-Zero where i liked keeping records. Your driving level is very good you should register on cyberscore they have long lists of players from around the world and your records would be in the top few in the UK i reckon. I was having a look on cyberscore. Aren't all the times/scores verified? It has a seperate list for the "proof scoreboard"
Sorry for late reply, yes Cyberscore as u see have a massive database so the validation process is ongoing. I can vouch for some of the players in there myself that they are legit, like Stacy Needham of UK as he is also a competitor on Super Mario Kart and Mario Kart Super Circuit (and i think MK64 too) for our own World Record sites. There used to be another DKR page but it was never updated frequently then went down. Def get your times on there, youe Ancient Lake looks good; they have all the categories, for car, hover and plane.